Jakes Quality Auto Repair has a lonf history behind it's name, and we bring hard work and determination to our customers on a daily basis. From oil changes to engine repair, no job is too small or big for us! 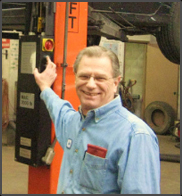 Jake's Quality Auto Repair was founded by Jake Lesnick in 1982. As a teenager growing up in Southern California, owning, revering and showing off a young man's car was a way of life for Jake. This is ingrained in him and now applies to his customers and their cars and trucks. For over 41 years, Jake Lesnick he has been providing excellent service and offering outstanding value to hundreds of customers in the Twin Cities. Jake is now recently retired and his son Brad is continuing on the Jakes Quality Auto Repair reputation. Brad is a ASE certified master technician with over 20 years of experience. He will work on building a relationship with you and prioritizing your repairs to fit your budget the best he can and will always treat your vehicle as if it were his own.